There are 1,024 printable Bible trivia questions and answers here. There are questions for all different age and difficulty levels: Young Believer (ages 5-14), Believer (ages 12-17), Scholar (adults), Scriptorian (advanced adults), Expert Scriptorian (good luck!). 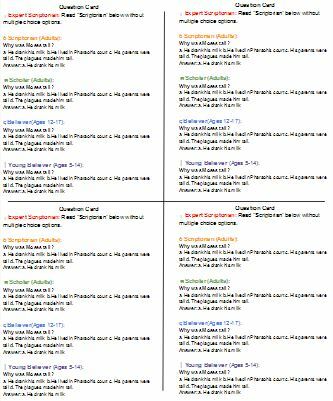 Print each set of trivia questions below, and then you can take them to a printer to cut for just a few dollars. However, if you would like to take a Bible quiz online, you can do it for free, and they are scored online. Done with the trivia questions and game? Go Back to Bible Trivia. Have fun with over 1,000 printable Bible trivia questions!